Withania somnifera commonly known as ashwagandha, is often touted as the Indian version of ginseng and traditionally known as ‘Ashwagandha’ or winter cherry . Ashwagandha is widely used in the most of the Indian herbal medicine and nutraceuticals for the treatment of various diseases including sexual and nervous disorders, diabetes, infectious diseases, cancer, ulcer, stress, immunological disorders, arthritis, etc. From the ancient time, it is used as a tonic to arrest the ageing process, rejuvenate the body and boost the defense against infectious disorders and also promote the longevity [2-11]. As ashwagandha root extract contains a wide array of phytochemicals and it is used as a dietary supplement for the better quality of life . The major active phytoconstituents of ashwagandha root extract are highly oxygenated withanolides. Withanolides have steroidal nucleus with side chain, having a six membered lactone ring. The oxidation at various sites of skeleton is responsible for the structural deviations in different classes of withanolides [11-14]. Literatures reported that withanolides such as withaferin A, withanolide D, withanolide E, etc. possess various pharmacological activities including antioxidant, anticancer, immunomodulating, antibacterial, neuroprotective, antiepileptic, adaptogenic, spermatogenic, antianxiety, antidepression, hepatoprotective, antiarthritic, anti-inflammatory, antimicrobial, antiulcer, hypoglycaemic, hypolipidemic, aphrodisiac, radiosensitizing, etc. [11, 14-19]. Therefore, a new proprietary herbomineral formulation was formulated that consisted of herbal product like ashwagandha root extract along with minerals such as magnesium, zinc, and selenium. This herbomineral formulation is designed as nutraceutical supplement and can be used for the prevention and treatment of various human disorders. From the ancient-time, the living force preserved by every living organisms that contributes the ‘life’ is defined as prana by the Hindus, qi or chi by the Chinese, and ki by the Japanese. This is believed to co-relate with the soul, spirit, and mind. This hypothetical vital force is considered now as the Bioenergetics Field. The Biofield Energy Field is a dynamic electromagnetic field existing surround of the human body. The Biofield Energy is infinite and paradimensional. It can freely flow between the human and environment that leads to the continuous movement or matter of energy [20, 21]. Thus, the human has the ability to harness energy from the earth, the “universal energy field” and transmit it to any living or nonliving object (s) around the globe. The objects always receive the energy and respond in a useful way. This process is known as Biofield Energy Healing Treatment [22, 23]. Biofield (Putative Energy Fields) based Energy Therapies are used worldwide to promote health and healing . The National Center of Complementary and Integrative Health (NCCIH) has been recognized and accepted Biofield Energy Healing as a Complementary and Alternative Medicine (CAM) health care approach in addition to other therapies, medicines and practices such as natural products, deep breathing, yoga, meditation, Qi Gong, Tai Chi, chiropractic/osteopathic manipulation, massage, special diets, homeopathy, progressive relaxation, guided imagery, acupressure, acupuncture, hypnotherapy, relaxation techniques, pilates, healing touch, movement therapy, rolfing structural integration, mindfulness, Ayurvedic medicine, traditional Chinese herbs and medicines, naturopathy, essential oils, aromatherapy, cranial sacral therapy, Reiki, and applied prayer (as is common in all religions, like Hinduism, Buddhism, Christianity, and Judaism) . The Biofield Energy Treatment (The Trivedi Effect®) has been extensively studied with significant outcomes in many scientific fields such as cancer research , biotechnology [27, 28], genetics [29, 30], altered antimicrobial sensitivity of pathogenic microbes in microbiology [31-33], altered structure of the atom in relation to the various metals, polymers, ceramics, and chemicals materials science [34-36], altered physical and chemical properties of organic compounds [37-39], pharmaceuticals [40, 41], nutraceuticals [42, 43], and improved overall growth and yield of plants in agricultural science [44, 45]. Herbal extracts and it’s formulations despite of their outstanding in vitro results exhibited poor or low in vivo activity, because of their low lipid solubility or improper molecular size, causing in deprived absorption and thus poor bioavailability. According to the recent study on the bioavailability of major withanolides of Withania somnifera, Devkar et al. demonstrated that the nonpolar and low molecular weight withanolides are highly permeable, whereas the high glycosylated and polar withanolides displayed low permeability in their in vitro absorption model system . As ashwagandha root extract has the outstanding nutrition and medicinal values, researchers are still working on to find out an optimal dosage range for reproducing the desired effects in human as well as to determine the safe, effective and non-toxic dosage form . The physicochemical properties such as surface area, particle size, crystalline structure, crystallite size, etc. and thermal properties of a drug play a vital role in bioavailability as well as stability of the drug during processing, formulation, packaging, and storage [48, 49]. Biofield Energy Treatment (The Trivedi Effect®) has been reported to change the particle size, specific surface area, crystalline, chemical and thermal behavior of an atom/ion through possible mediation of neutrinos . By considering all these aspect, the objective of the current study was to determine whether The Trivedi Effect® - Consciousness Energy Healing Treatment (Biofield Energy Healing) can change the physical, structural, and thermal properties of ashwagandha root extract in such a way that might be assist in the improvement of the solubility and absorption of ashwagandha root extract and also help in designing of any suitable pharmaceutical formulation. The physical, spectroscopic, and thermal properties of both control and the Biofield Energy Treated ashwagandha root extracts were evaluated using various analytical techniques include Fourier transform infrared (FT-IR) spectrometry, ultraviolet-visible (UV-vis) spectroscopy, powder X-ray diffraction (PXRD), particle size distribution analysis (PSD), thermogravimetric analysis (TGA), and differential scanning calorimetry (DSC). Withania somnifera root extract powder was one of the components of the new proprietary herbomineral formulation, developed by our research team, and it was used per se as the test compound for the current study. The test compound was divided into two parts, one part of the test compound was treated with The Trivedi Effect® - Consciousness Energy Healing Treatment (Biofield Energy Healing) by renowned Biofield Energy Healers and defined as Biofield Energy Treated sample, while the second part of the test compound did not receive any sort of such treatment and defined as untreated or control ashwagandha root extract sample. The Trivedi Effect® treatment was provided by the group of twenty renowned Biofield Energy Healers who participated in this study and performed the Biofield Energy Treatment (The Trivedi Effect®) remotely. Thirteen Biofield Energy Healers were remotely located in the U.S.A., five were located in Canada, and two were located in Australia, while the test compound was located in the research laboratory of GVK Biosciences Pvt. Ltd., Hyderabad, India. The Trivedi Effect® - Consciousness Energy Healing Treatment was provided for 5 minutes through Healer’s Unique Energy Transmission process remotely to the test compound under the laboratory conditions. None of the Biofield Energy Healers in this study visited the laboratory in person, nor had any contact with the compounds. Similarly, the control sample was subjected to “sham” healers for 5 minutes, under the same laboratory conditions. The sham healer did not have any knowledge about Biofield Energy Treatment. After that, the treated and untreated samples were kept in similar sealed conditions and characterized thoroughly by PXRD, PSD, FT-IR, UV-visible spectroscopy, TGA, and DSC analysis. TGA analysis was performed using Instrument TGA Q50 (TA Instruments, USA) at a heating rate of 10°C/min from room temperature i.e. 30°C to 900°C under nitrogen atmosphere. A total of ~13.5 mg of sample was used for the analysis and was taken on the platinum pan. In TGA, the weight loss for each step was recorded in grams as well as in percent loss with respect to the initial weight. Also, the onset, endset, and peak temperature for each step were recorded in TGA. Powder X-ray diffraction study was carried out to examine the crystalline pattern of the control and Biofield Energy Treated ashwagandha root extract. 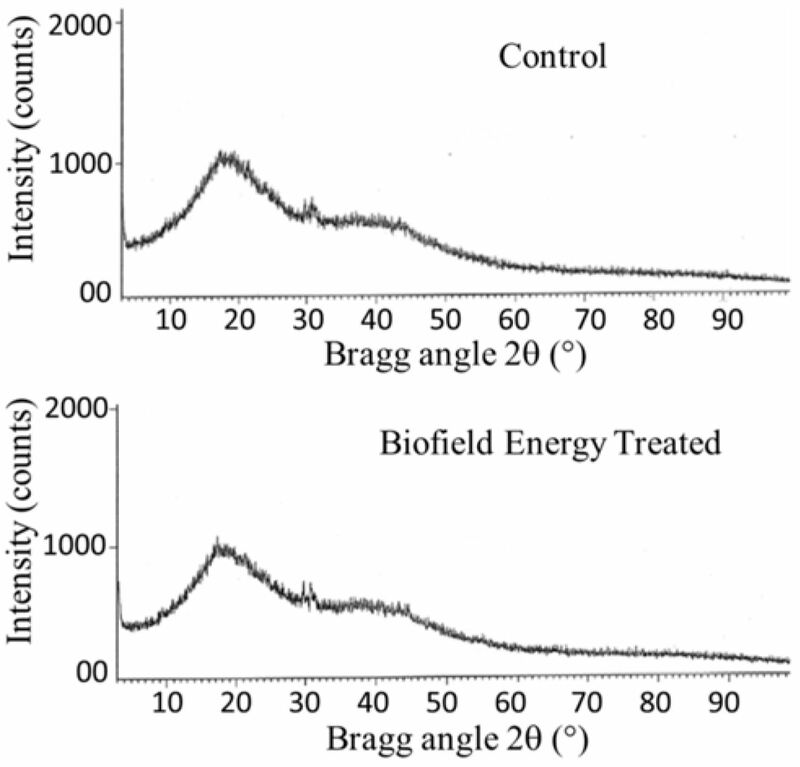 Figure 1 showed the PXRD diffractograms of both the control and Biofield Energy Treated sample, which did not contribute any diffraction peaks. It was then concluded that both samples are amorphous in nature and the Biofield Energy Treatment has no effect compared to the control sample. Particle size distribution analysis of the control and Biofield Energy Treated ashwagandha root extract was performed and the results are presented in Table 1. The particle size values of the Biofield Energy Treated ashwagandha root extract at d10, d50, and d90 were significantly decreased by 18.88%, 8.60%, and 4.00%, respectively compared to the control sample (Table 1). Similarly, the surface area of the Biofield Energy Treated ashwagandha root extract (0.077 m2/g) was significantly increased by 102.63% compared to the control sample (0.038 m2/g). The results revealed that there might be an effect of Biofield Energy Treatment in the intrinsic physico-chemical properties of ashwagandha root extract. Many literature mentioned that particle size, shape and surface area of the pharmaceuticals/nutraceuticals have an important impact on solubility, dissolution rate, in vivo bioavailability, dose uniformity and therapeutic efficacy as well as assist in the design of the new drug delivery systems [48, 51]. Decrease in particle size, and increase in the surface area increase the solubility of the solid particles as well as enhance the dissolution rate and bioavailability . Thus, it is anticipated that The Trivedi Effect® treated ashwagandha root extract might be absorbed in faster rate and thus, can provide better bioavailability than the untreated sample. Equation (6) showed that if other factors remain constant, the vibrational frequency (wavenumber) is directly proportional to the force constant i.e. for a certain functional group (for e.g. -C=O), changes in the vibrational frequency (wavenumber) indicate the alteration of the force constant. Several factors such as hybridization, resonance, bond strength, conjugation, etc. can affect the force constant [53, 54]. 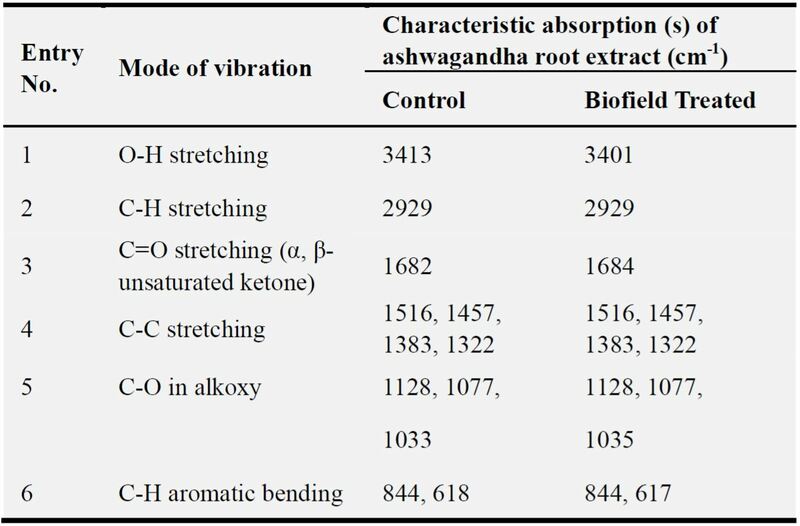 It has been observed that the vibrational frequencies for the C-H, C-C, C-O, and C=O groups of the Biofield Energy Treated ashwagandha were almost similar to the control sample (Figure 2; Table 2, entry 1-6). 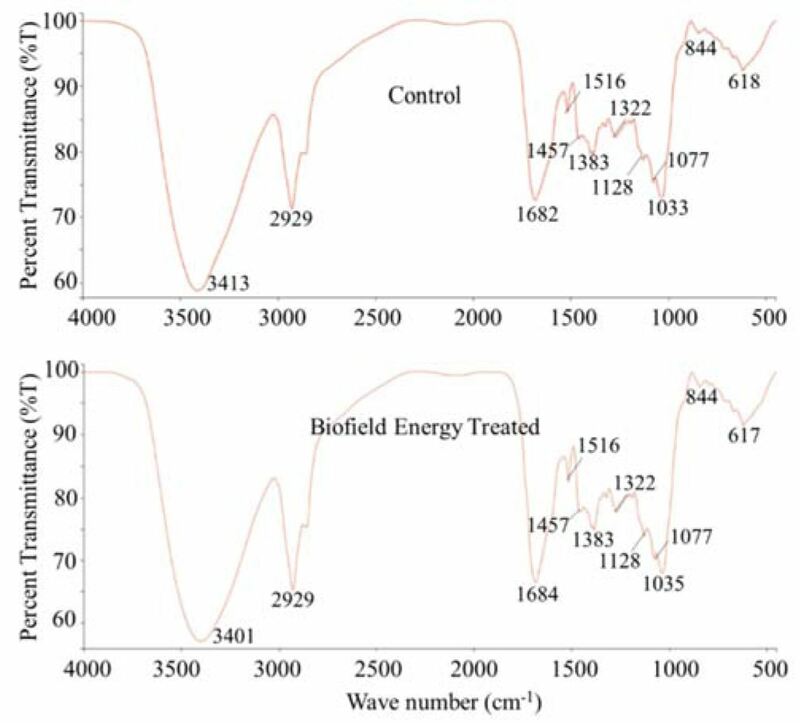 The spectra indicated the O-H stretching at 3413 cm-1 in the control sample, and was shifted downward to 3400 cm-1 in the Biofield Energy Treated sample. It indicated that there was the reduction in force constant of O-H functional group in the Biofield Energy Treated sample compared with the control sample. The broad peak at 3600-3200 cm-1 may be due to the O-H functional group frequency of the hydroxyl groups present in Withania somnifera. It indicated that the force constant of these groups was remained unchanged. The presence of epoxide, unsaturated lactone, 1-keto-2-ene functions play a vital role to elicit the pharmacological activities of withanolides [14, 55-57]. In summary, FT-IR results suggest that there was a little impact of Biofield Energy Treatment on Withania somnifera at the atomic level to reduce the force constant of O-H (str.) bond. 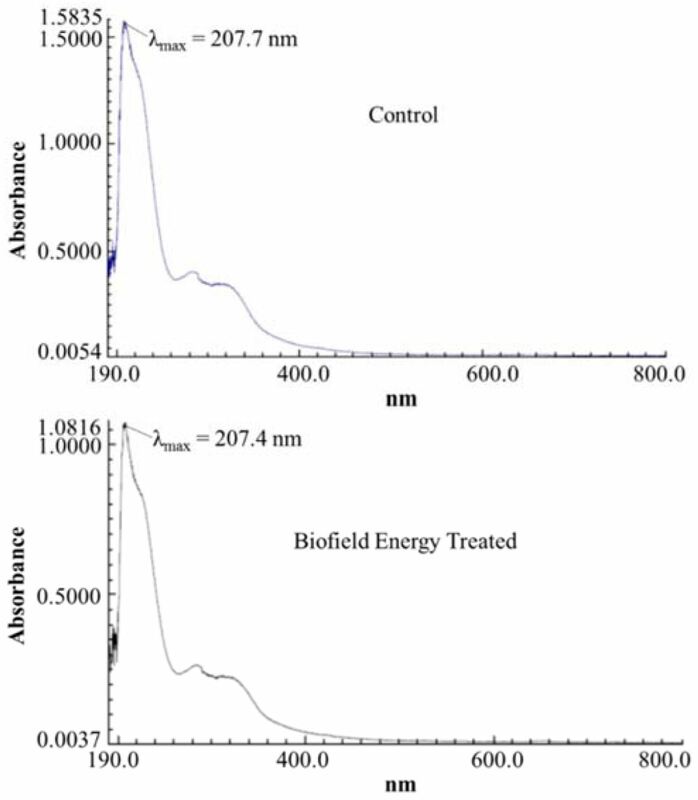 The UV-visible spectra of the control and Biofield Energy Treated ashwagandha root extract are shown in the Figure 3. The wavelength for the maximum absorbance (λmax) of the control and Biofield Energy Treated ashwagandha root extracts were at 207.4 and 207.7 nm, respectively and there was a minor shift of absorbance maxima from 1.5855 in the control sample to 1.0831 in the Biofield Energy Treated sample. The UV absorbance occurs due to the different type of energy transitions from the singlet to the singlet excited state such as α→α*, n→π*, and π→π*. These type of electronic transitions are happened when the difference in energy between the lowest unoccupied molecular orbital (LUMO) and the highest occupied molecular orbital (HOMO) is significantly higher than the activation energy of the compound . It has been reported that the wavelength for the maximum absorbance for the ashwagandha root extract was at 208.50 nm. Thus, no significant change in the λmax of the Biofield Energy Treated sample was observed compared to the control sample. Hence, it is anticipated that the structure of the phytoconstituents in the treated sample was remained unaffected as compared with the control sample. TGA was carried out to investigate the thermal stability of the control and Biofield Energy Treated ashwagandha root extracts. The TGA analysis showed three steps of thermal degradation as mentioned in Table 3 and Figure 4. In the 1st and 3rd steps of thermal degradation, the weight loss of the Biofield Energy Treated sample was decreased by 1.88% and 3.91%, respectively compared with the control sample. But, in the 2nd step of thermal degradation, the weight loss of the Biofield Energy Treated sample was slightly increased by 0.76% compared with the control sample (Table 3). However, the total weight loss of the Biofield Energy Treated sample (79.42%) was reduced by 0.13% compared with the control sample (79.52%). It is then anticipated that Biofield Energy Healing Treatment might enhance the thermal stability of ashwagandha root extract. The DTG thermograms of the control and Biofield Energy Treated ashwagandha root extract (Figure 5) displayed two broad peaks. The maximum thermal degradation temperature at 272.73°C and 393.14°C for two broad peaks in the Biofield Energy Treated ashwagandha root extract was increased by 1.13% and 0.85%, respectively compared to the control the sample (269.68°C and 389.83°C). Overall, the thermal stability of the Biofield Energy Treated ashwagandha was increased compared to the control sample. The DSC thermograms of the control and Biofield Energy Treated ashwagandha root extract are presented in the Figure 6 and Table 4. The DSC thermograms of the control and Biofield Energy Treated samples indicated the presence of a broad endothermic inflection at 85.82°C and 86.98°C, respectively which may be the evaporation of the bounded water present in the ashwagandha root extract. This evaporation temperature and latent heat of vaporization were increased by 1.35% and 5.52%, respectively in the Biofield Energy Treated sample compared with the control sample (Table 4). It is assumed that the Biofield Energy Healing Treatment might altered the intermolecular force in the Biofield Energy Treated sample, which probably increases the heat change. This result suggests that the temperature for water removal of the Biofield Energy Treated sample was increased compared to the control sample. 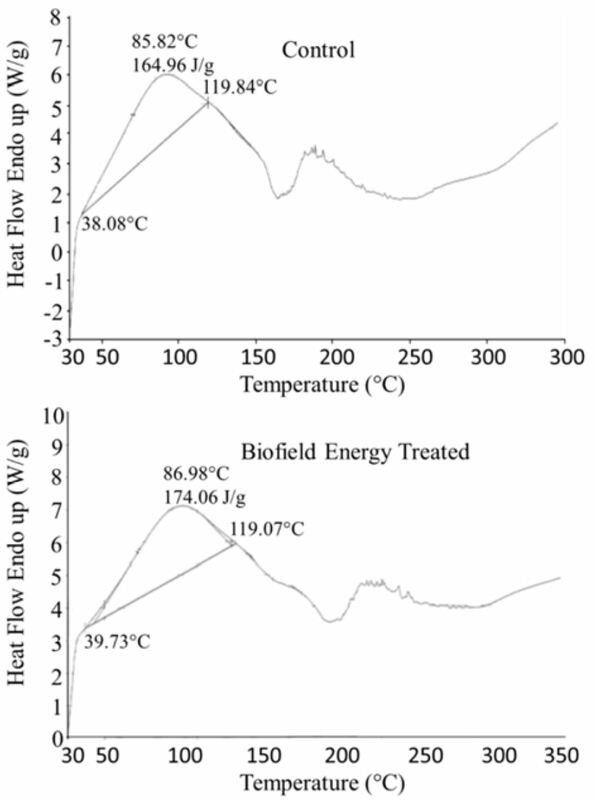 However, Biofield Energy Treated, and control W. somnifera indicated several endothermic peak around 200°C (Figure 6). Several small endothermic peaks were also observed in the thermogram of both in control and treated samples, which may be due to the multiple phytoconstituents present in the root extract in a very small concentration [60, 61]. The study revealed that The Trivedi Effect® - Consciousness Energy Healing Treatment (Biofield Energy Healing Treatment) has the significant effect on the particle size, surface area and thermal stability of the ashwagandha root extract. PXRD analysis demonstrated that both the control and treated samples were amorphous in nature. The particle size values at d10, d50, and d90 of the treated sample were decreased significantly by 18.88%, 8.60%, and 4.00%, respectively compared with the control sample. Similarly, the surface area of the treated sample was significantly increased by 102.63% compared to the control sample. FT-IR results suggest that there was a little impact of Biofield Energy Treatment on ashwagandha root extract at the atomic level to reduce the force constant of O-H (str.) bond. TGA revealed the three steps of thermal degradation steps and the total weight loss was decreased by 0.13% in the treated sample compared with the control sample. Consequently, the maximum thermal degradation temperature for two broad peaks in the treated sample was increased by 1.13% and 0.85% compared to the control the sample. DSC analysis indicated that the evaporation temperature and latent heat of vaporization were increased by 1.35% and 5.52%, respectively in the treated sample compared with the control sample. The overall thermal analysis indicated that the treated sample was thermally more stable as compared to the control sample. In summary, The Trivedi Effect® - Energy of Consciousness Healing Treated ashwagandha root extract could have better solubility, absorption, dissolution, bioavailability, and long-term storage stability compared with the control sample and could be suitable for any pharmaceutical and nutraceutical formulation which might be providing better therapeutic response against various diseases such as diabetes mellitus, allergies and septic shock, stress-related disorders like sleep disorder, anxiety, insomnia, depression, Attention Deficit Disorder (ADD), Attention Deficit Hyperactive Disorder (ADHD), mental restlessness (mind chattering), low libido, brain frog, impotency, lack of motivation, mood swings, confusion, fear of the future, migraines, headaches, forgetfulness, overwhelm, loneliness, indecisiveness, worthlessness, frustration, irritability, chronic fatigue, obsessive/compulsive behavior and panic attacks; immunological and inflammatory diseases disorders like Lupus, Systemic Lupus Erythematosus, Hashimoto Thyroiditis, Type 1 Diabetes, Chronic peptic ulcers, Asthma, Tuberculosis, Hepatitis, Chronic active hepatitis, Celiac Disease (gluten-sensitive enteropathy), Addison Disease, Graves’ Disease, Crohn's disease, Pernicious and Aplastic Anemia, Sjogren Syndrome, Rheumatoid arthritis, Irritable Bowel Syndrome (IBS), Multiple Sclerosis, Chronic periodontitis, Myasthenia Gravis, Ulcerative colitis, Chronic sinusitis, Atherosclerosis, Diverticulitis, Vasculitis, Dermatitis, Rheumatoid Arthritis, Reactive Arthritis, Psoriasis, Alopecia Areata, Scleroderma, Fibromyalgia, Chronic Fatigue Syndrome and Vitiligo; aging-related diseases like cardiovascular disease, Alzheimer’s disease, arthritis, cancer, dementia, cataracts, osteoporosis, diabetes, glaucoma, hypertension, hearing loss, Parkinson’s Disease, Huntington’s Disease, Prion Disease, Motor Neurone Disease, Spinocerebellar Ataxia, Amyotrophic lateral sclerosis, Spinal muscular atrophy, Friedreich’s Ataxia and Lewy Body Disease, chronic infections, and many more. DSC: Differential scanning calorimetry, FT-IR: Fourier transform infrared spectroscopy, HOMO: Highest energy occupied molecular orbital, LUMO: Lowest energy unoccupied molecular orbital, TGA: Thermal gravimetric analysis, Tpeak: Peak vaporization temperature, ∆H: Latent heat of vaporization, UV-vis: Ultraviolet-visible spectroscopy, PSD: Particle size distribution, PXRD: Powder X-ray diffraction.